Marco Rubio faces allegations about his financial past. 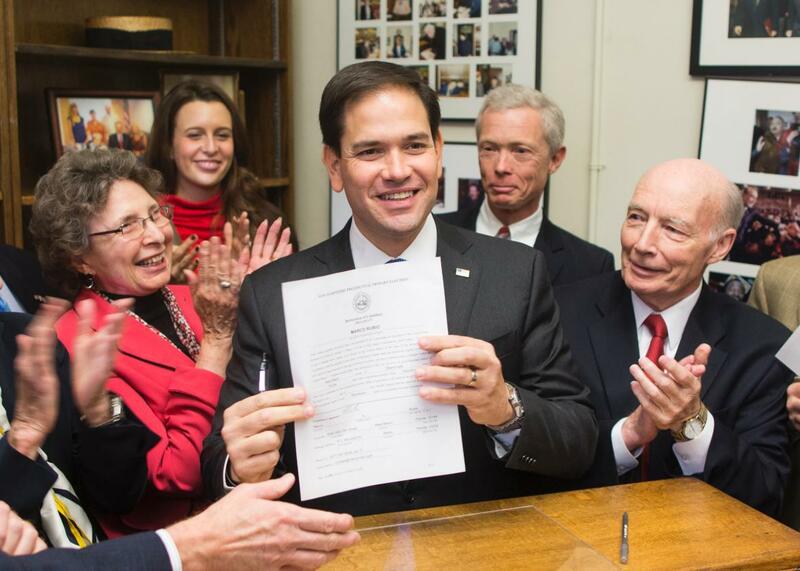 Marco Rubio files paperwork for the New Hampshire primary at the State House on November 5, 2015 in Concord. Pressed during the last Republican debate about his history of questionable financial decisions, Marco Rubio effectively responded with a shrug. “You just listed a litany of discredited attacks from Democrats and my political opponents,” Rubio told CNBC moderator Becky Quick, “and I’m not gonna waste 60 seconds detailing them.” The Florida senator quickly pivoted to his preferred talking points—“I’m not worried about my finances; I’m worried about the finances of everyday Americans”—and the debate moved on. Rubio, though, is finding that questions about his money management skills are not going away now that he’s surged to the front of the establishment lane for his party’s nomination. In the days since the debate, his rivals have begun to hammer Rubio on the issue—and it’s no surprise who’s leading the charge. “For years, I’ve been hearing that his credit cards are a disaster,” Donald Trump declared Tuesday, taking a welcome break from mocking Rubio for sweating too much. Rubio has been down this road before. Back in June, the New York Times detailed his many personal financial missteps at length: a brush with foreclosure on a second home in 2010 after being late with mortgage payments; his 2012 decision to spend part of a $800,000 book advance on a boat rather than paying down his considerable debts; his 2014 liquidation of a retirement account that prompted a hefty tax penalty; and the 2015 selling of his second home for $18,000 less than he and his friend paid for it a decade ago, to name a few. Rubio, though, was able to survive the ensuing media storm much the way he dodged Quick’s question on the CNBC stage—by crying media bias and presenting himself as former working-class kid who faced his share of financial hardships. It’s no surprise the spin worked; it’s hard to see how struggling to make ends meet disqualifies a man from being the leader of a country were many people struggle to make ends meet. And, as my colleague Jamelle Bouie argued at the time, it’s not as though the skills it takes to balance a family budget are the same as those needed to manage a country. This time, though, Rubio may not escape so easily. The attention has now shifted from decisions that were simply financially imprudent to ones that come with the distinct whiff of potential wrongdoing. Specifically, his rivals are eager to relive Rubio’s past use of a Republican Party credit card for personal expenses back when he was the speaker of House in Florida. Rubio has conceded that he did indeed use the GOP card for personal matters, but says he ultimately paid for those charges himself. He’s now being asked to prove it. His campaign says that won’t be a problem and has promised to release records in “the next few weeks” showing just that. “Our plan has always been to release these,” aide Todd Harris told the New York Times this week. That statement, though, is difficult to believe given that Rubio has rebuffed similar requests for years. “Those credit card statements are an internal party matter,” he told the editorial board of the Times-Union of Jacksonville in 2010. “I’m not going to release them.” More recently he declined requests for the records in June and again last month from the Tampa Bay Times. If Rubio wanted to release the records, he’d have done it by now. Adding to Rubio’s woes is that this is hardly a one-off issue. Rubio has a history of playing fast and loose with his finances and then excusing himself with a Whoops, my bad. Back in 2008, the Miami Herald discovered that Rubio failed to disclose, “a $135,000 home-equity loan he obtained from a bank controlled by his political supporters.” Rubio responded by quickly amending his financial disclosures and dismissing the whole thing as an oversight. Likewise in 2010, the Tampa Bay Times discovered that Rubio “double-billed the Republican Party of Florida and state taxpayers for eight flights while he was House Speaker.” Rubio, again, dismissed it as an unfortunate mistake, and promised to repay the party what he owed. Such excuses may have worked in the past. Rubio, though, is about to find out if they still will now that he’s a GOP favorite for president.